The goal of ASKALON is to simplify the development and optimization of applications that can harness the power of Cloud computing. The ASKALON project crafts a novel environment based on new innovative tools, services, and methodologies to make scientific application development and optimization for real applications and execution on Cloud environments an everyday practice. Resource broker service targets negotiation and reservation of resources required to execute a scientific application. Resource monitoring supports the monitoring of Cloud resources by integrating and extending existing Grid resource monitoring tools and by developing new techniques for resource monitoring (e.g. rule-based monitoring). Information service is a general purpose service for scalable discovery, organisation, and maintenance of resource and application-specific data (including online and post-mortem). Workflow executor service targets dynamic deployment, coordinated activation, and fault tolerant completion of activities onto the remote Cloud sites. 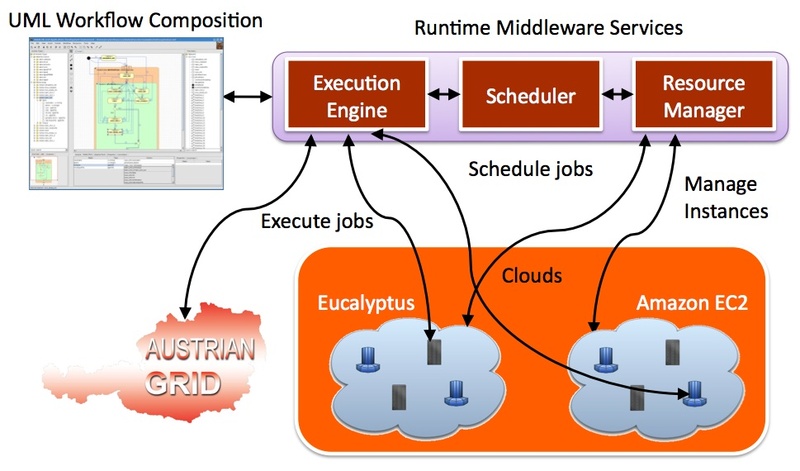 (Meta)-scheduler performs appropriate mapping of single or multiple workflow applications onto resources from the Cloud or Grid. This work continues our initial scheduling efforts in the context of the ZENTURIO experiment management and optimization tool. Performance prediction is a service through which we are currently investigating new techniques for accurate estimation of execution time of atomic activities and data transfers, as well as of Cloud (spot instances) and Grid resource availability. Performance analysis is a service that unifies the performance monitoring, instrumentation and analysis for scientific applications and supports the performance bottleneck interpretation. Askalon provides a rich set of visualization diagrams for post-mortem and online visualization.